Comparison tests have shown the BlackBerry 10 web browser to be faster than its equivalent on Apple's iOS 6 and the new version of Windows Phone. The long-awaited software and first handsets will not be officially launched until January 30, but developers have had their hands on early builds for months, in order to prepare apps for the platform. The Gadget Masters website used the BlackBerry Dev Alpha B handset and a developer build of BB10 and placed it up against the iPhone 5 on iOS 6 and the HTC 8X running Windows Phone 8. The tests (shown in the videos below), showed the Webkit-based BB10 handset to render pages much faster than both rival platforms, although the site is yet to test against an Android handset. The BlackBerry 10 operating system is the most important software launch in the illustrious history of the Waterloo, Ontario-based company. Long delays have seen the company's market share drop dangerously close to irrelevancy, while the latest financial figures have raised questions about how much is left in the kitty to turn RIM around. 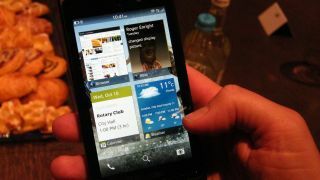 It'll take more than a faster web browser to give BB10 a shot at taking on Apple and Android, but this in itself is good news for those hoping for a RIM resurgence in 2013.